No matter if they are organic or not, people with an apple allergy can’t eat them. But some apples don’t result in that awful scratching and itching. Here’s why and which. It started around the time when I was 13. At that age I already was not big on fruit and vegetables, but my mom finally coaxed me into eating an apple, because “they are so healthy”. Having images of various toothpaste commercials before my inner eye (here in Germany they featured people biting into apples with shiny, healthy teeth), I took a huge bite and chewed. Moments after I swallowed, all hell broke loose. A violent itching started inside my throat. I felt like pushing my hand in and scratch. Then it got company by a swelling of the affected tissue. Not able to unhinge my jaw, I sat it out. After that, apples were dead for me. 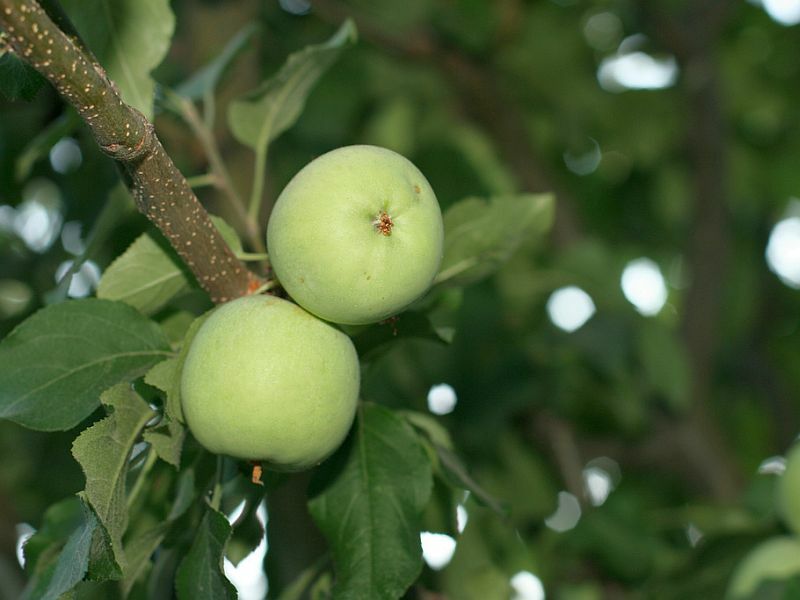 Years later my girlfriend and I were on a bike ride on the pleasant little Friesian island of Föhr on the German coast and came upon a wild apple tree bearing luscious little apples. Their appetizing looks and getting something for free fought with my unpleasant childhood memory. The inner “it’s on sale” conditioning won out and I bit into one. And ate it. And then another. And another. At the end I had eaten five or six, savouring the delicious taste without getting even the slightest hint of an allergic reaction. Why not? First I reasoned that the lack of an allergic reaction was because nobody had treated the wild apples with any fertilizers or insecticides. Back at home I bought organic apples, but with them the allergy reaction was back home, too. This had me stumped until now, when I finally tried to get to the ground of it. I couldn’t take trips to a Friesian island just to eat some apples, after all. It turns out that the difference between wild and supermarket apples lies in their “phenols” – organic compounds that give apples resistance against bacteria and add to their color. Because they can also cause a sour taste, farmers bred them out of most apple varieties you today get to buy at supermarkets. Wild apples usually contain more phenols. That was a crucial decision for allergy sufferers. Because the phenols also provide another function: they keep the allergens people react to in check. Scientists discovered this connection already in 1980, when they found that the allergens in apples only get active when you neutralize the phenols. Unfortunately no one ever gave this research much regard. If you are allergic to apples, but still want to eat them here and then, there are a couple of ways you can still your craving. First of all, you can find a wild apple tree of your own, but that’s a bit impractical. Instead shop for “old” apple varieties; this Smithsonian article gives you an idea what to look for. It’s fairly safe to say that anything found at a supermarket won’t work for you, but at a farmer’s market you may get lucky and find a seller specializing in the rarer types of apples. Another option is to buy one of the usual suspects, picking a variety you don’t react that strongly to. Then let it sit and wait. Over time the amount of phenols in apples builds up and you may be able to eat them. Whatever you do, be careful, because your allergic reaction may not be identical to mine and come on much stronger. When you give it a try, take a small nibble and look for any reaction. If it doesn’t come, take a slightly bigger nibble etc. If there is any unpleasantness, stop. And if you ever suffered from or have any reason to believe that you may experience anaphylaxis, don’t try it at all! Pictures courtesy of “rumpleteaser” and Rasmus Lerdorf.